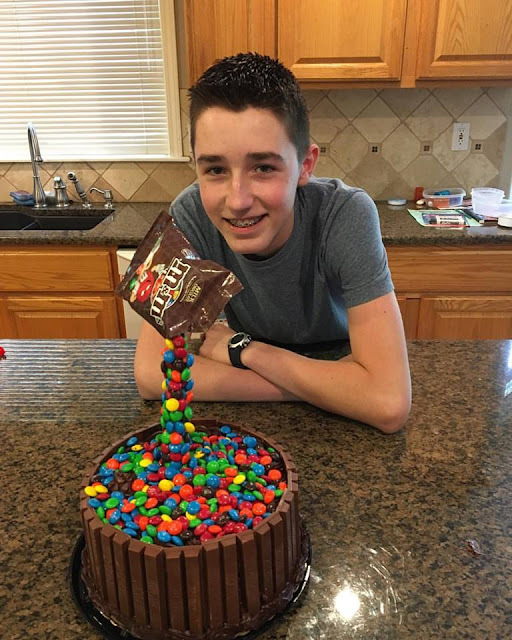 Today is Josh's 16th birthday! SIXTEEN! I still can't believe my little boy is that old. That was the fastest sixteen years ever. Josh is an amazing kid and I am so lucky to be his mom. Josh is my type A child. A list maker since he was a toddler, he's the most organized, driven person I know. When Josh sets his mind to something, he sees it through. Shawn and I have often said that we didn't really raise Josh, we simply got out of his way, lol. He's always got a plan and a project and a goal and a pile of checklists to help him get there. Josh is funny and kind and sweet. When I'm having a bad day, he's the first one to ask how he can help. So happy birthday to my sweet boy. He may be almost six feet tall, but he's always going to be my little boy. I love him so much! My hair is red, plane tickets are booked. Oh crap, I have to get on an airplane in a month. Cue month long panic attack. So much trip planning this week! So Josh has decided to cancel his class trip to the east coast so that he can compete in National History Day nationals. It was a really hard decision and there was much discussion and debate, but in the end he just felt that he had worked too hard to get to nationals not to see it through. He can travel to the east coast any time, but he may never have another opportunity to compete in nationals. So this week we're trying to pin down our plans, and it's been really complicated. The discussion for a while was who was going to go with him. Just Josh and Shawn? Just me and Josh? Shawn, Josh and me? Costs were a factor for us all to go. I would miss school, and that's an issue. Shawn would miss work, and that's sometimes tricky. I've been to DC before and Shawn hasn't so I would rather him get the opportunity to go. I hate to fly, so that's an issue. We've gone over this a million times at this point. Finally I THINK we've decided that Shawn and I are both going with Josh. It's a big deal for Josh and I want to be there. It will be fun for us both to go. Now the trick has just been figuring out flights, which has been ridiculously complicated. Part of the issue is that Josh isn't coming back with us. We're all going to fly to DC, participate in NHD, and then we're leaving Josh there to meet up with his France group and Shawn and I are coming home without him, and he needs a flight out of DC two weeks later when he gets back from France. But it needs to coordinate with his teachers flight, and it needs to be timed just right to meet up with when they're getting back from France, which isn't working so well. He may end up spending the night in DC with his teacher, which is awkward of course, so they're getting two hotel rooms, and it's all just a lot to figure out and coordinate. I was on the phone with his teacher at 11:00 last night trying to figure it out. Plus when we priced flights going to DC, it was significantly cheaper for us to go a day early, so we're trying to work all that out. So basically this has just been a really complicated, stressful thing to figure out. There are a whole bunch of independent parts that needs to coordinate perfectly together for all of this to work and I'm having a really hard time making it all fit. Somehow we're all going to get there and I'm sure we'll have a great time, but the planning of it is really stressing me out. And I'm juggling that right now with some other stress I have going on. I've got a lot of school stuff on my plate this semester. The religion class I'm taking this semester is more complicated than the previous classes I've taken, and it involves a bunch of little projects that I'm still trying to figure out. It's a bit of a confusing class and I'm frustrated by it. We take turns teaching the class during the semester and at the last minute they asked me to fill in for someone and teach this week, and I'm not really prepared for that at all, so I'm stressed about that this week. My mind is on trying to figure out plane tickets to Washington DC right now, school is taking a backseat for a few days. Also, if I get plane tickets to DC, that means I have to fly on a plane. Uuuuggghh. I have to REALLY want to go somewhere to tolerate getting there on a plane. So I'm already stressed out about the fact that I have to fly next month. I have to really mentally prepare myself to fly. I wish I didn't hate it so bad, but I just despise airplanes. It's probably my number one anxiety trigger, and I have a lot of anxiety triggers. Knowing I have to fly is like this THING looming over me. I'm super excited to be in DC, but getting there and back is already making me sick to my stomach just thinking about it. Oh, and while we're on the topic of decisions, I have a hair appointment this afternoon. Should I put the red highlights back in? I think yes, but I haven't decided yet. If this blog post is jumbled, it's because that's the way my mind is functioning today! Airplanes, school assignments, hair appointments, hotel reservations, teaching the class, whose going to watch Matthew and Clarissa while we're gone, Josh flying home with his teacher, I need to find a time to meet with my Brazilian English speaking partner this week, oh crap, I have to fly on an airplane!!! That is what is racing through my head today. I need to sit down and look at hotels, but I can't because I have a school lesson to plan, but I can't concentrate on that because I'm having airplane anxiety, and I don't have time for any of that because I have to figure out what to do with my hair before my appointment in a few hours. It's 9:30 am and I think I need a nap and some anxiety medication. I keep telling myself that all of this is going to work itself out, and it will. Maybe it's a good thing I have a hair appointment today. My hair lady is like my therapist. It takes a long time to highlight my hair, we should have plenty of time to work my life out while I'm there. Ok, so now I'm going to go attempt to do some homework. First things first. If I get school out of the way I might just be able to focus on trip planning this afternoon after my hair appointment. Oh crap, I think I have to fly on an airplane. Deep breaths.